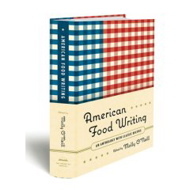 Molly O’Neill is the editor of American Food Writing: An Anthology: With Classic Recipes. Her comprehensive book is a collection of essays, stories and recipes that celebrates 300 years of American food writing – from Meriwether Lewis’ hunts during his journey across the continent to modern-day foodies. Molly, former host of the PBS series Great Food, shares some of her favorites from the anthology.